Here comes the spring and when the spring comes, the first thing we all want to do is to leave the gloom and doom of winter behind us. One sure way of achieving this is by going into spring cleaning mode and/or re-decorating our home. The problem is that when you start, you never know how far it will lead you. You paint a wall and before you know it, you are re-decorating the whole house indoor, outdoor and top to bottom. It is for this reason that my husband, goes an anxious shade of white as soon as I whip out my marigolds and start peppering my sentences with expressions such as “just a lick of paint”, and “de-clutter”. He would argue that these things are best left to the professionals or, even better, that one shouldn’t start at all. So, what happens when you get into “house sprucing” mode, and what is your definition of “Spring clean”: is it simply an efficient and thorough cleaning ritual, where you hoover behind your sofa for the first time since last May, or do you go the full Monty; getting rid of all your clutter, emptying out all draws and cupboards, giving all your books and unwanted gifts to charities and/or dumping the whole lot in the nearest skip? Of course, the next logical step after having de-cluttered your home is DIY, because the one benefit of clutter is that it hides an awful lot of sins. Chips, crack, flaky wall-paper, lime scale and mossy tiles: once the clutter’s gone there is nothing for them to hide behind…and then there are the little touches like new door knobs and lampshade, blinds and curtain: all the things that add up to create a brighter and more comfortable environment. Believe it or not, spring/summer is the right time to check you roof and change your boiler. Have the later serviced before the bad weather starts again. We all know how difficult it is to find a good and reliable plumber who will turn up on time and who will not try to rob you blind. Staunch and Flow plumbers are Gas plumbers servicing London. - Work to Gas Safe regulations putting your safety first. It is designed to make an approximate estimation of the building works prices. It gives average installation costs under each home improvement category, which will give potential customers a guide for typical building costs and prices for their installation projects. Builders often charge more for sourcing material but what if you wanted to source your own and then pass it on to your builder. It is a good idea to ask builders to quote material and labour separately. Again Builders Town London team offers estimation service free of charge, no obligation. Their final quotation is divided into two separate sections with precisely detailed information on the labour costs and building materials with links to the suppliers, which can be verified by the customers. Absolute openness and fair attitude plays its crucial role when the customers are making their decision. It is worth knowing at this stage that the price you will get by going direct will always be more expensive than if you are a tradesman. Always give as tight a brief as possible, including as much information and specifics about all aspects of the work you want done. A written brief is a good idea. Ask the builders to quote according to the same headings you have to ensure that you are also comparing like and like. How many coat of paints? What type of paint including brand name? Windows and woodwork including sanding? Making good where necessary? Primer? Undercoat? How many coats? Weatherproof paint if outdoor? Etc. No need to have a dramatic overall sometime, a few new pieces of furniture here and there can to the trick. However, you may find that the furniture you currently have has passed its sell by date and that you are craving for a few new pieces. The problem is that you have not found anything in the shop that you like: you liked the shape but not the material or you liked the material but no the shape. Think bespoke furniture, the type you will not find anywhere else. 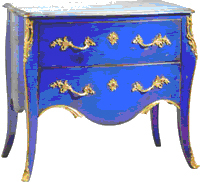 Frenchy Furniture, offers a large selection of hand-crafted French items. Cherry wood, beech are finished with satin or distressed looks, perfect for those wanting a vintage style. Traditional upholstery methods are used with fabrics including horse hair and Individual springs for maximum comfort. which produces hand-crafted copies of originally master-crafted furniture, like those pieces found in museums, such as the Wallace Collection. Traditional finishing methods such as hand buffing with natural beeswax are used to make the furniture. In addition, you are able to chose the material you would like out of a wide range that Frenchy Furniture has on offer.